With all the buzz about smartwatches, you have to wonder what the point of having another computer on your wrist is. It seems like dead weight. I recently purchased a Jawbone UP band, and I finally understand the wearable computer craze. First of all, What is an UP? An UP band is a bracelet made for tracking your fitness health. 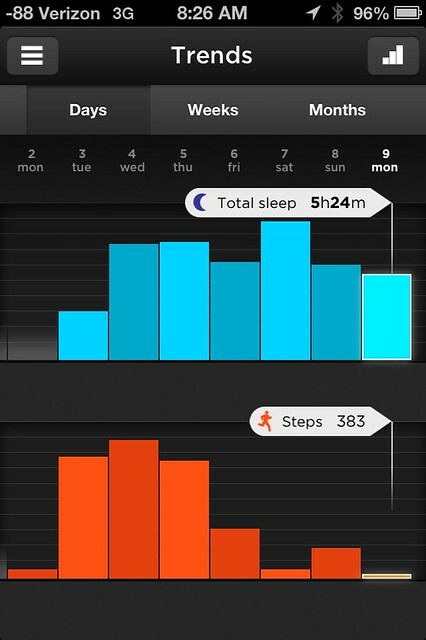 It counts steps, miles, and calories, measures sleep and naps, and basically just records your life. In addition, it’s got a few features that help you manage your life, like alarms, and activity notices. It then plugs into your headphone jack on your phone, where you’re free to change your life in any way you please. As a guy, and one who doesn’t often wear a watch, it felt a bit weird wearing it first. It’s literally made to be worn 24/7, which is something new to me. After the first day or so it felt completely natural. I notice it only when it’s off really (basically when I go swimming). The only thing you really have to do is charge it every 10 days (take that Samsung), and plug it into your phone for a minute, once or twice a day. If you choose, you can also log sleep (which we’ll get into later), by changing it into sleep mode. A Jawbone day starts when you wake up. 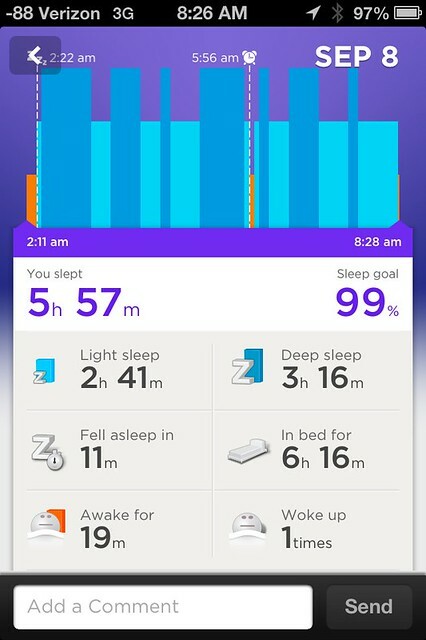 You can optionally set alarms (day-specific too), and the Jawbone will help wake you up with vibrations to your wrist. It’s definitely effective, and it feels kind of good. Now here comes the amazing thing about UP. Once I got into it, it kept me really motivated to live healthily. I set a goal of 10,000 steps, and I really try to reach it every day. The most amazing thing was that one day when it was 11 P.M, and I was about 6,000 steps short, I literally got onto a treadmill and ran three miles. That was the longest distance I’ve ever run, and far more than I do on an average day. The pace was even far faster than I normally run. I ended up 40 steps short for the day, but I felt a sense of accomplishment at the comeback, and I was motivated to try again later in the week. How Often Do You plug your UP band in? What does the UP app tell you? The whole process of plugging the band in and syncing takes around 30 seconds, so I do it around twice a day. 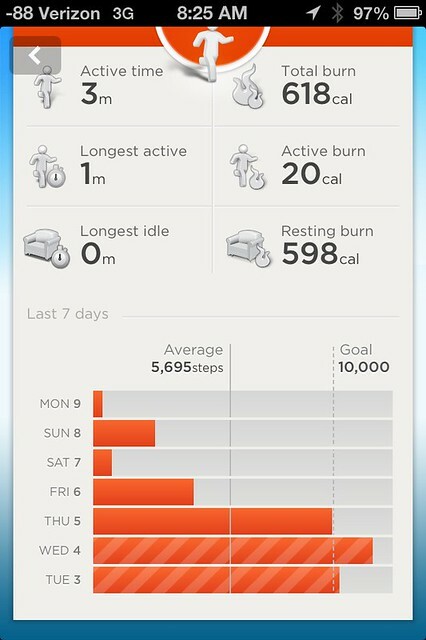 The data that the Jawbone UP provides is really cool. It gives the miles you’ve walked that day, steps, calories burned at rest, and while active, and it even has historic data, so you can compare to previous day. Press a button before bed, and when you get up, and Jawbone will tell you how long it took you to fall asleep, how long you slept lightly, how long you slept deeply, how your sleep patterns work, and even if you woke up in the middle of the night. I have a friend who showed me her night’s sleep, complete with three wake-ups, and went on to verify that they indeed did happen. “That one was the cat, and that one a half hour later was the dog”. As for me, I’ve found an optimal sleep pattern, and noticed that I’m crankier when I wake up in the middle of the night, and when I have less sleep – though frankly I didn’t need the band to tell me that last part. It’s even been motivating me to sleep more. I’m a nighthawk, and the Jawbone is a good motivator for getting me to bed. 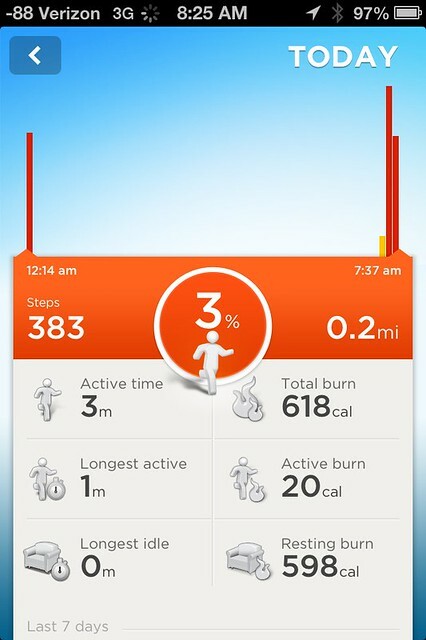 The UP band, like anything Jawbone makes, is beautiful. It’s not marred with labels, logos, or weird designs. With no visible display, a fine rubber and aluminum exterior, and a bracelet-like design, Jawbone is meant to blend in, making it perfect for everyday life. Mine, Onyx (black) looks pretty “badass”. One of the coolest design elements is the single button, positioned to blend in, made out of solid aluminum, and positioned at the end of the bracelet. It has a nice feeling when pressed, and it’s hard to press accidentally. The lighted icons that serve to alert you to mode, are completely concealed by the rubber. Only when the button is pressed, are they made visible, in full color, straight through the rubber. In everyday life, Jawbone UP is relatively comfortable, with a few big exceptions. Because of the band’s thickness and sharp edges, typing on a laptop can often be uncomfortable. It’s also a bit awkward using the restroom, and eating with it on, and I often take it off for those activities. Alas, no gadget is perfect. In testing, I’ve found often inflated counts of steps, as well as steps that never even happened (i.e steps while lying on the couch). The UP relies on just a few sensors and some imperfect algorithms, and they prove not to be scientifically accurate. At $130, the UP is a steal. It can be a bit uncomfortable at times, but most of the time it looks and feels great. The data may not be entirely accurate, but it is plenty accurate for everyday life. For the jobs assigned, the UP does a remarkable job, at a remarkably good price. Review: Blogeasy For Mac, Not So Easy?